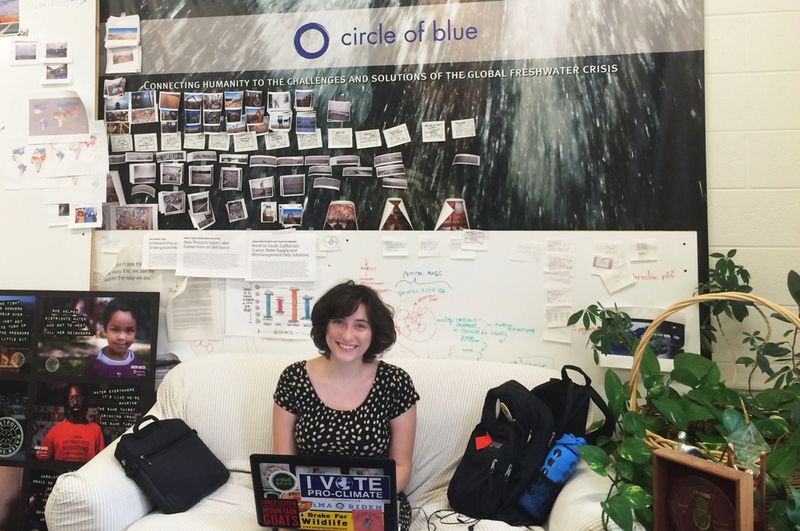 Miranda Cawley settles into Circle of Blue’s office in Traverse City, Michigan, during her first week as an editorial intern. It was November in the lower coastal Andes of Ecuador. There were no fall leaves, like I typically see at this time of year in my native New York. Rather, I was wrapped in mist and surrounded by acres of blackberry bushes and tomato plants. Don Ramiro, a tall, lean man with a habit of running his hands through his thick dark hair, surveyed his crops when I asked him what would happen if the water went away. “Migrar,” he said. Migrate. There would be nothing else to do, he told me. I realized with a jolt that the oasis surrounding me, the endlessly fertile land giving rise to a breadbasket of produce, was all dependent upon one thing: the water from the rivers. That water was in danger of disappearing due to a hydroelectric dam that was being constructed at the base of the watershed; the dam would compete with farmers for increasingly scarce water supplies. The path that led me to the fields of Ecuador’s Dulcepamba watershed was as long and winding as the rivers that cut through it. I grew up within walking distance of Long Island’s barrier islands and the Great South Bay, and yet I never considered the true value of the resource right in my backyard. Instead, I was much more interested in food policy. In high school, I began a community garden that provided fresh organic produce to my town’s food pantry. The water that allowed the garden to grow was always a given. When I started at the Medill School of Journalism at Northwestern University in 2012, I planned to be a political journalist, like many of my classmates. That changed when I attended a lecture by Justin Gillis, a climate reporter for The New York Times. Gillis made a case for the importance of covering the environment and teaching scientific literacy to young journalists. I immediately made up my mind to drop my current path and declared a second major in environmental science. My studies and continued interest in food policy led me to co-found Real Food at NU, a food-justice advocacy organization at Northwestern. As a chapter of the Real Food Challenge, a national student-led campaign, Real Food at NU challenged me to think about the ripple effects that our food system has on the rest of the world and how the environment in turn influences our food system. But it wasn’t until I was watching food-security battles play out before my eyes in Ecuador that I realized how crucial water security is to a flourishing food system. For the 35,000 farmers in the Dulcepamba watershed, a lack of water means a loss of livelihood, which will in turn affect the food sovereignty of the entire nation. As an intern for Circle of Blue’s editorial team this summer, I hope I can continue to explore the nexus of water, food, and energy. I plan to provide multimedia coverage of the drought in California, and I will continue to study the changing landscape of the Dulcepamba watershed by reporting from Ecuador, as well. This is my first time living in Michigan, and I look forward to discovering the abundant local and organic food that’s found here. I would love to hear your suggestions for what I should try! Comment below, send me an email at mirandacawley@gmail.com, or tweet @miranda_cawley. I am Mark Moore from Toowoomba Queensland Australia, A plumber of nearly forty years in the industry. I have just your read your article and found it interesting. I have a passion to for the reuse of grey water particularly for the use of flushing the toilet after giving it a basic treatment. Hear in Australia there is a lot of talk but not much action. Can you tell me is there any such thing like that happening in the states. It seems a terrible waste to use good quality water Class “A ” water drinking standard , to flush the toilet.